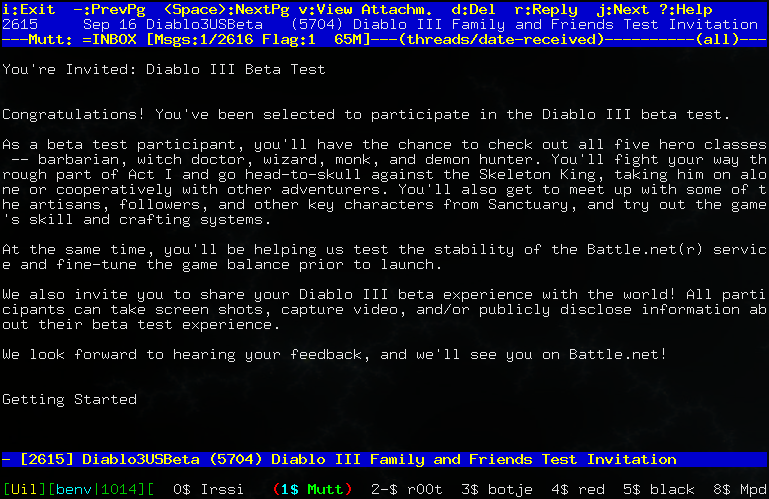 to make sure it wasn’t another battlenet phishing scam I noticed that the Received headers really came from blizzard.com, and they even signed the mail with a domainkey. Also they didn’t include some link but simply told me to go to battle net and get the goods there. 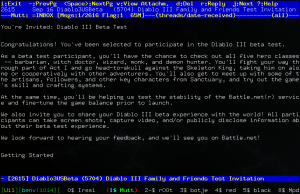 We also invite you to share your Diablo III beta experience with the world! All participants can take screen shots, capture video, and/or publicly disclose information about their beta test experience. Today I decided it was time to get rid of both backscatter and the useless spamfiltering of mail that will bounce anyway. Obviously I’m not running a vanilla qmail, but a patched version (by John M. Simpson) of Qmail that adds lovely antispam features such as checks for reverse dns records, SPF records, fixes a ton of annoyances and generally makes Qmail a lot nicer.